"It is a must-win game for both and while neither side have hit the high notes of previous seasons, it does look like Green Bay are a little stronger." A pair of Super Bowl winning Quarter Backs meet on Thursday with both teams scrambling around to keep in the play-off picture. The Seahawks sit 4-5, firmly in second place behind the all-conquering 9-1 Rams. While the Packers are 4-4-1 and two games behind the Bears in their conference. For both teams it's starting to get into must-win territory as they chase a wildcard spot. Before this season, it is hard to imagine any team going to the home of the Seattle Seahawks and winning with something to spare. Russell Wilson and his team were dominant at home, they held one of the best records for home field advantage in the league. But that is no more. Unbelievably, Seattle have lost four of their last five games at home. It's not all bad news for Seattle, they looked very good on Sunday against the Rams, going 75 yards on their opening drive for a touchdown and leading going into the fourth quarter. However, once again, they failed to win. What has changed for Seattle over the last season? The answer is, Russell Wilson. Now, before you all come out after me, it's not that he has become a bad QB. In fact, the opposite, Seattle have survived on Wilson making things happen in the fourth quarter and teams have got wise to it. Seattle are 1-8 in its last nine games decided by one score or less. Over the past two seasons, Seattle is 5-11 in one-score games. Seattle and Wilson use to thrive in these games, now they are losing them. Wilson already has 24 comebacks in the fourth quarter in his career. If Seattle want to make the play-offs Wilson needs help, he may not have the team around him to get it though. With seven games to go for Seattle it does take a lot of ifs and buts to plot their course to the play-offs but looking at the wildcard position right now it would appear that the Panthers, Vikings and Packers are the three teams in front of Seattle in that race. Seattle play all three in the run-in and they need to win all three, starting on Thursday night. For Green Bay, the situation is just as precarious. As we said, the NFC picture is a hazy one but the loser of this might find the play-offs a bridge too far. When it comes to QBs that can perform miracles, maybe no one is better than Green Bay's Aaron Rodgers. 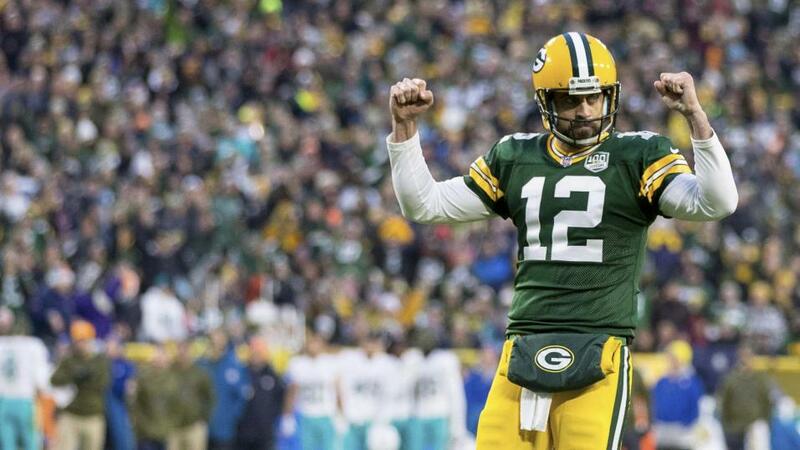 Regarded by many in the game as the best around, Rodgers may not have the rings the Brady has, but he is right there at the top and you get the feeling he his starting to get hot again. In his last five games, Rodgers has thrown for 1,611 yards (322.2 per game) with 10 touchdowns and zero interceptions. Look deeper and Rodgers has thrown 17 touchdowns with just one interception all season. After a few injury setbacks this year, the 34-year old is entering a crucial time of the season looking in good shape. The upturn in form for him and Green Bay is not all down to Rodgers, and may show Seattle what they should be doing. The Packers are running the ball more and running it well. The emergence of Aaron Jones as number one RB is helping keep defences on their toes. On Sunday Jones rushed for 145 yards and two touchdowns, averaging 9.7 yards per carry. If Green Bay does have a problem, it is their form away from home. The Packers are 0-4 on the road. They also lost their last two away games of last season so are technically on a six game away losing streak. That needs to change and they can start on Thursday, at a venue they have not one in since 2008. It is a must-win game for both and while neither side have hit the high notes of previous seasons, it does look like Green Bay are a little stronger. The Packers are tied for sacks in the NFL this year at 31. Wilson has been sacked eight times in his last four games. Seattle must help their QB out and may have to rely on their ground game, which has spluttered a little this season. The feeling is they may not be able to drive the ball up the field, handing the ball to Rodgers at crucial periods. In a game of who will have the ball in the fourth quarter, Seattle's weaknesses may play into Rodgers hands.